Patriotic Decorations - Mantel Decor for under $10! 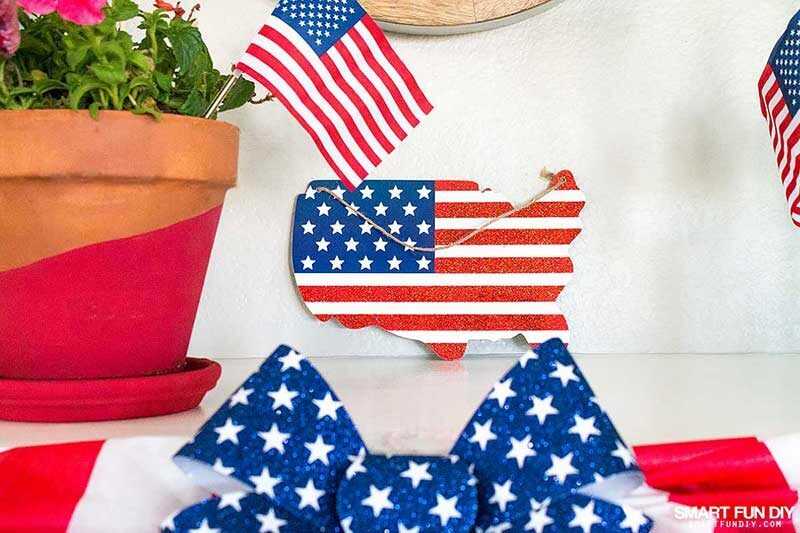 You are here: Home / Home + Garden / Patriotic Decorations – Mantel Decor for under $10! 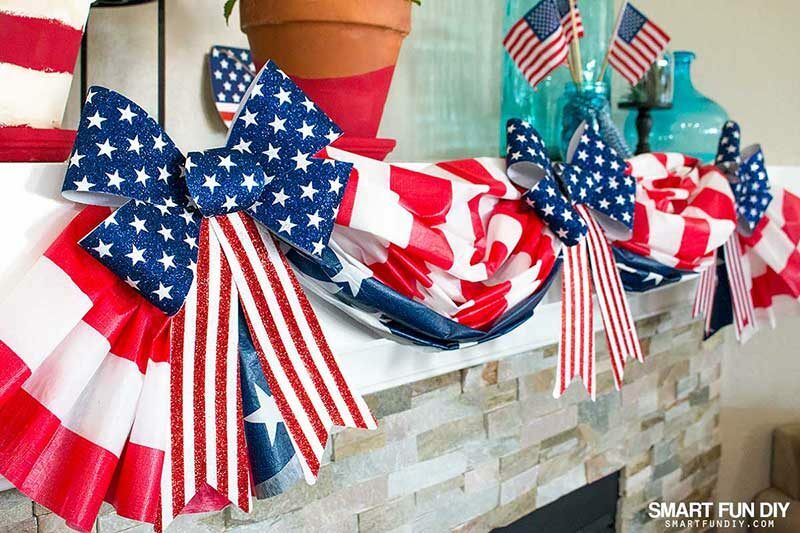 Patriotic Decorations – Mantel Decor for under $10! Every year 99 Cents Only Stores knocks it out of the park with their amazing 4th of July patriotic decorations. 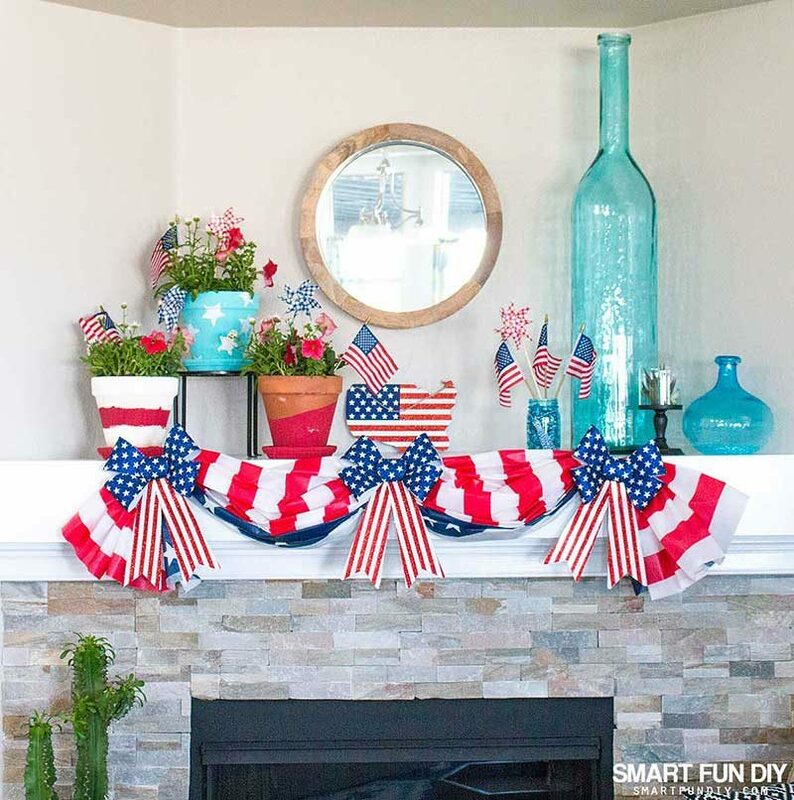 If you love the look of patriotic swags then you are gonna love this DIY idea for decorating your mantel with a faux swag. And yes, most of the supplies for this patriotic wall decor cost under 99 cents each! This post contains affiliate links; if you make a purchase from these links, I may earn a commission at no additional cost to you. I love making DIY party decor and holiday projects … but if you don’t have time to get crafty, you can get this and decorate crazy fast. While I love my remodeled fireplace mantel, this isn't going to make anyone excited for the 4th of July! 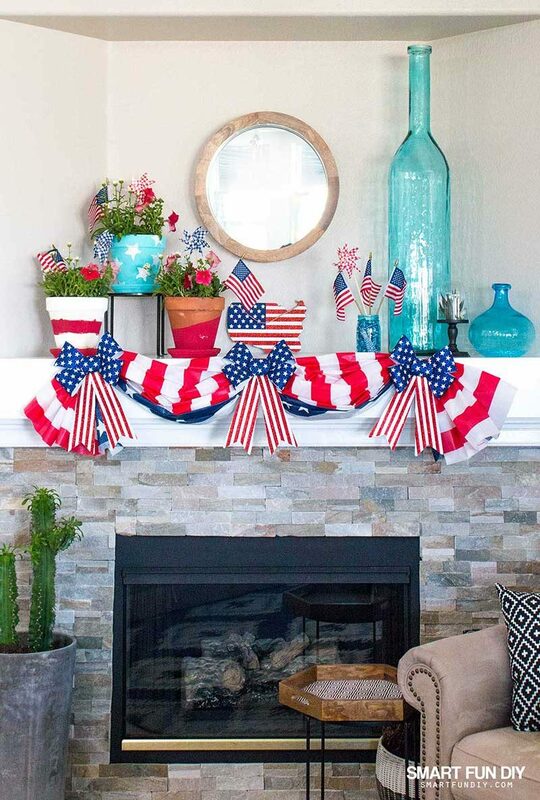 The base for this patriotic mantel decor design is a faux swag. Like I said before, I love the look of swags but they are crazy expensive. This affordable look starts with a 99 cent tablecloth. Yes, a tablecloth! You can do this same technique with any holiday tablecloth. And stores like 99 Cents Only have holiday tablecloths for every season. I can't wait to try this same faux swag technique for Halloween and Christmas. Open a plastic table cloth and unfold it. Spread the table cloth on a table. Fold the tablecloth width-wise in large pleats, about 5-6″ wide. Grip the pleated tablecloth in the middle and bunch together tightly. Twist a twist tie around the bunched middle of the tablecloth. The bows from 99 Cents Only have twist ties on them so you can twist a bow onto the tablecloth at the same time. Grip the pleated tablecloth at each end, about 12″ from the edge. Attach the bow or tighten with a twist tie. Attach the swag to the mantel with tape at the places where it is bunched (where the bows are). Fluff the swag and enjoy! Decorate your fence with a flag swag, like this one by Martha Stewart crafts or you can get this to decorate super fast. To finish out the look, place extra flags and pinwheels in a mason jar filled with buttons or marbles. 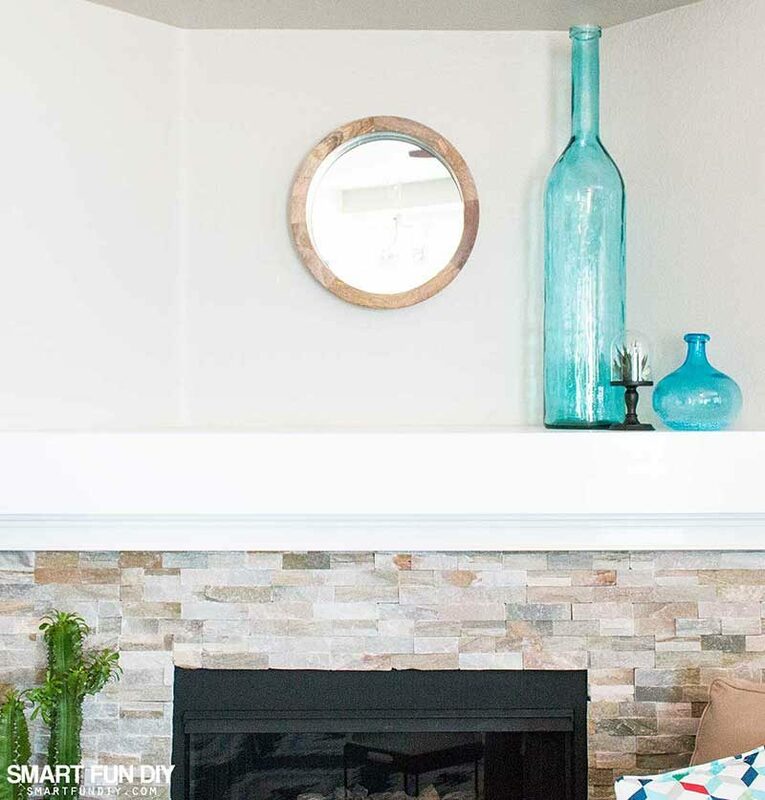 Set a flag sign (also from 99 Cents Only) against the wall or hang it if there is nothing in the center of your mantel. Finally, add potted plants or fresh flowers to add a pop of color and fun. Easy peasy patriotic decorations, right? 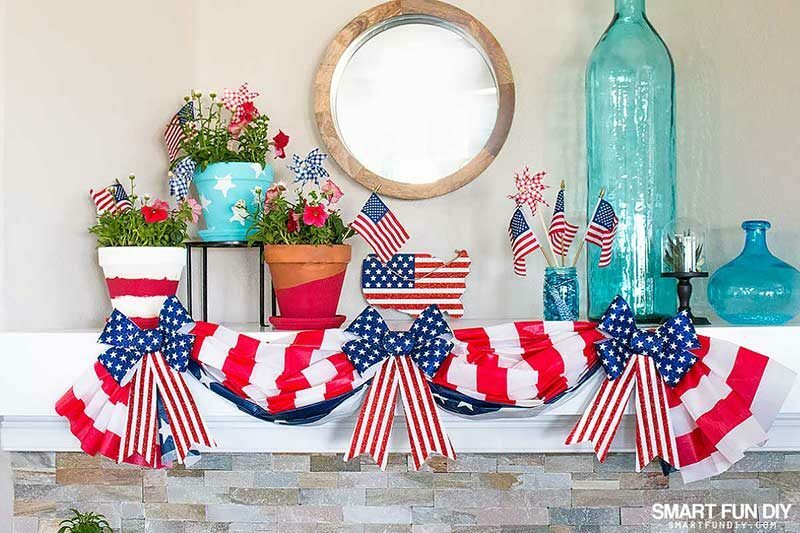 What's your favorite way to decorate for the 4th of July? Really cute! I’m all for using what I have to decorate my mantle for the holidays. Thanks for sharing these great money saving ideas with SYC. I love your tablecloth swag! I never would have realized it was a tablecloth. Your decor is so festive and pretty. 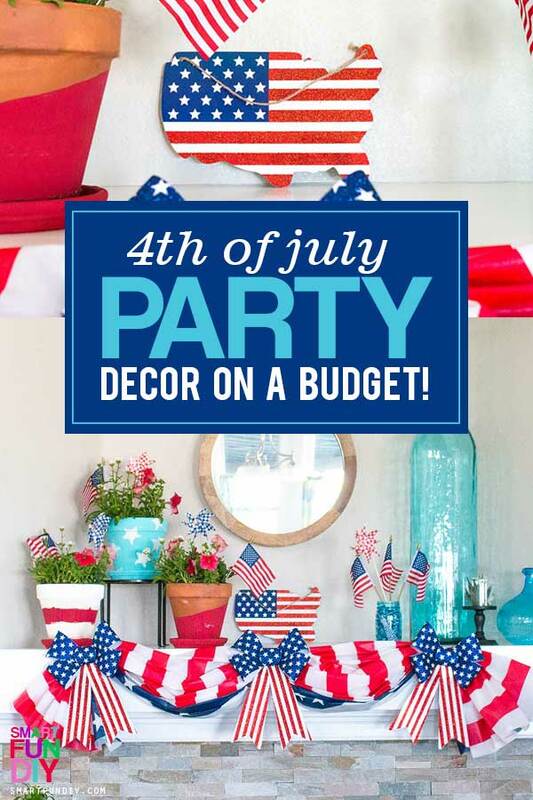 This post is being featured in a Patriotic Decor roundup at the next Merry Monday party. We love your creativity.